This is, I think, the clearest, most comprehensive articulation that I've seen, of what Pope Francis is trying to do as Pope. Some of his actions and words have, at times, been seen with confusion and ambiguity. His "style" can be abrupt and imprecise, especially in comparison with his two immediate predecessors. But here, there is nothing unclear or objectionable in what he's laying out, and there is a full embrace of Tradition, just as I also embrace, believe, and strive to act. Especially, his words here are full of charity and joy, as he invites his brother bishops (and, through them, all of us) again to work with him in the vineyard of Christ. Read the whole thing at the above link. The heart of the Pope expands to include everyone. To testify to the immensity of God’s love is the heart of the mission entrusted to the Successor of Peter, the Vicar of the One who on the cross embraced the whole of mankind. 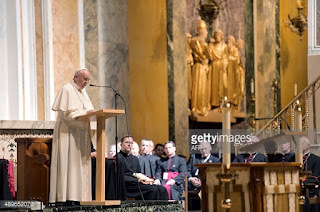 May no member of Christ’s Body and the American people feel excluded from the Pope’s embrace. Wherever the name of Jesus is spoken, may the Pope’s voice also be heard to affirm that: “He is the Savior”! From your great coastal cities to the plains of the Midwest, from the deep South to the far reaches of the West, wherever your people gather in the Eucharistic assembly, may the Pope be not simply a name but a felt presence, sustaining the fervent plea of the Bride: “Come, Lord!” Whenever a hand reaches out to do good or to show the love of Christ, to dry a tear or bring comfort to the lonely, to show the way to one who is lost or to console a broken heart, to help the fallen or to teach those thirsting for truth, to forgive or to offer a new start in God… know that the Pope is at your side, the Pope supports you. He puts his hand on your own, a hand wrinkled with age, but by God’s grace still able to support and encourage. 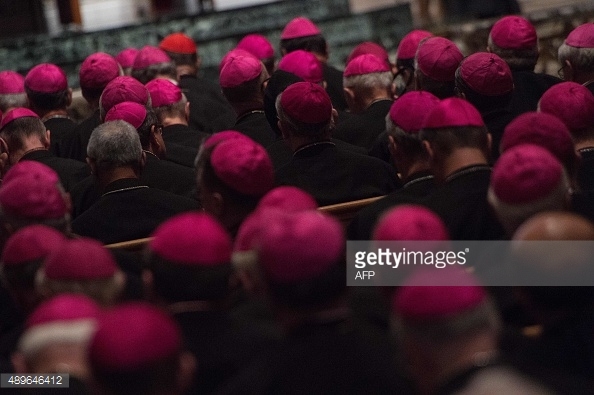 We are bishops of the Church, shepherds appointed by God to feed his flock. Our greatest joy is to be shepherds, and only shepherds, pastors with undivided hearts and selfless devotion. We need to preserve this joy and never let ourselves be robbed of it. The evil one roars like a lion, anxious to devour it, wearing us down in our resolve to be all that we are called to be, not for ourselves but in gift and service to the “Shepherd of our souls” (1 Pet 2:25). The heart of our identity is to be sought in constant prayer, in preaching (Acts 6:4) and in shepherding the flock entrusted to our care (Jn 21:15-17; Acts 20:28-31). Ours must not be just any kind of prayer, but familiar union with Christ, in which we daily encounter his gaze and sense that he is asking us the question: “Who is my mother? Who are my brothers?” (Mk 3:31-34). One in which we can calmly reply: “Lord, here is your mother, here are your brothers! I hand them over to you; they are the ones whom you entrusted to me”. Such trusting union with Christ is what nourishes the life of a pastor. The great mission which the Lord gives us is one which we carry out in communion, collegially. The world is already so torn and divided, brokenness is now everywhere. Consequently, the Church, “the seamless garment of the Lord” cannot allow herself to be rent, broken or fought over. Our mission as bishops is first and foremost to solidify unity, a unity whose content is defined by the Word of God and the one Bread of Heaven. With these two realities each of the Churches entrusted to us remains Catholic, because open to, and in communion with, all the particular Churches and with the Church of Rome which “presides in charity”. It is imperative, therefore, to watch over that unity, to safeguard it, to promote it and to bear witness to it as a sign and instrument which, beyond every barrier, unites nations, races, classes and generations. Bishop Olmstead (Phoenix) - "Into the Breach"